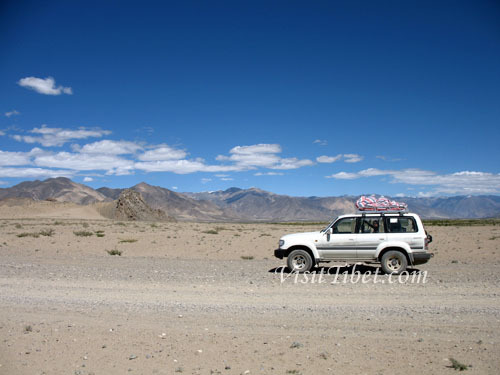 DRIVE TO EVEREST BASE CAMP OVERLAND TIBET BY JEEP- 8 to 10 days custom tours. Mt. Everest Base Camp Tibet with Rongphu Monastery, highest inhabited place on earth (5468m/18,000 feet) in the foreground. ***IMPORTANT NOTICE: The new border and road between Nepal and Tibet post earth quake is now open. 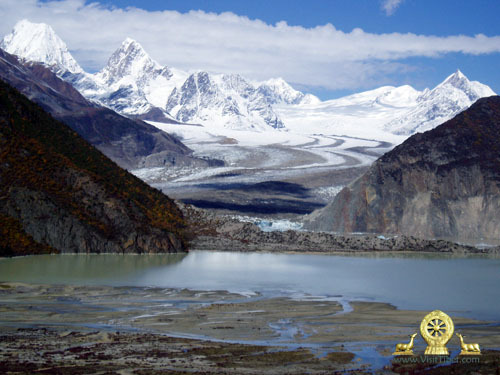 The Tibet with Mount Everest Base Camp Tour is a very comprehensive tour of Tibet with visits to the cultural, historic and natural attractions of Tibet. The tour includes all the important places of interest in central & south Tibet including a visit to Rongphu Monastery and Mt. Everest Base Camp. After flying in to Lhasa from Kathmandu, Chengdu or Beijing, explore the cultural and historic sites of Lhasa, Shigatse and Gyantse. Afterwards drive overland, in 4-WD jeeps, across the Tibetan highlands and high passes to the fabled Rongphu Monastery and Mt. Everest Base Camp from where the view of the great North face of Mount Everest is the most spectacular of all. From Rongphu drive over the high Himalayas through rural farms and villages to the magical kingdom of Kathmandu, Nepal. > Participants should arrive Kathmandu at least 2 to 3 days in advance for permit processing. > Flights to Lhasa are also available from Chengdu, Shanghai, and Beijing in China. > Private tours available on request. Fly Kathmandu to Lhasa in Tibet. 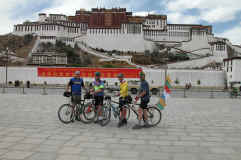 Transfer to hotel in Lhasa. Afternoon free for rest and acclimatize. Hotel. Drive to Gyantse passing the Yamdrok Tsho (Turquoise Lake) and crossing the Karo La pass. Visit The Khumbhum Stupa & Phalkor Monastery. Hotel. Drive over Pangla pass to Rongphu Monastery situated below the giant North Face of Mt. Everest. Rongphu Monastery Guest House. (8 kms each way). Rongphu Monastery Guest House. Drove over pass to Kyrong, overnight hotel Phakpa Lhankang. Drive through the beautiful rural life Nepal to Kathmand. FITNESS: The Kathmandu, Lhasa, Everest Base Camp tour involves five to six hours driving per day, but comparatively little walking (indeed, walking is not mandatory). However, it is all at very high altitude which will take a physical toll. There are no special physical requirement, but high altitude experience is a bonus. TRAIN between Beijing and Chengdu and Lhasa is now running full swing. Don't forget to check out our group "TIBET MOUNTAIN BIKE EXPEDITION "
Tim Ripple for the benefit of finding a common spelling mistake used when searching Everest on search engines.